Beer Temple owner Christopher Quinn has been using rare brews to build a name for himself since he and his wife, Margaret, opened the craft-beer store at the beginning of the year—and it's working. On opening day he offered samples of Westvleteren XII and Dark Lord Russian Imperial Stout (two of the rarest beers in the world) from his private stash; for the official grand opening in February he pulled out all the stops, giving out samples of more than 30 unusual and hard-to-find specimens, including Sam Adams Utopia, Bells Batch 9,000 and 10,000, Goose Island Bourbon County Bramble Rye, and Three Floyds cognac-barrel-aged Dark Lord with chiles. 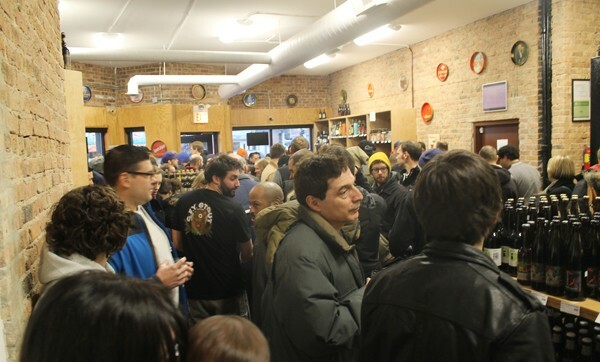 The fact that the event was free ensured a packed house; ditto with a vertical tasting he did in late April of seven vintages of Dark Lord (2007-'13). When Quinn opened the store that day, he said, there were 75 to 100 people already waiting outside the door. Quinn has a few bottles open for customers to taste almost every day, though they're not usually as sought-after as the abovementioned beers. He also sometimes has rare beers for sale—they never last long, but in the past he's had Founders KBS, Sierra Nevada Barrel-Aged Bigfoot, Bourbon County Cherry Rye, and Dogfish Head 120-Minute IPA. In which our correspondent attends the annual festival of beer and metal that revolves around Three Floyds' notorious Russian imperial stout. Westvleteren XII: The greatest beer in the world?